German mathematician; born May 9, 1818, at Goldberg, Silesia; died April 5, 1861, at Breslau. In the year of his graduation (Ph.D. Berlin, 1842) he was appointed teacher at a "Realschule" in Berlin, and in 1846 was admitted to the philosophical faculty of the university as privat-docent. 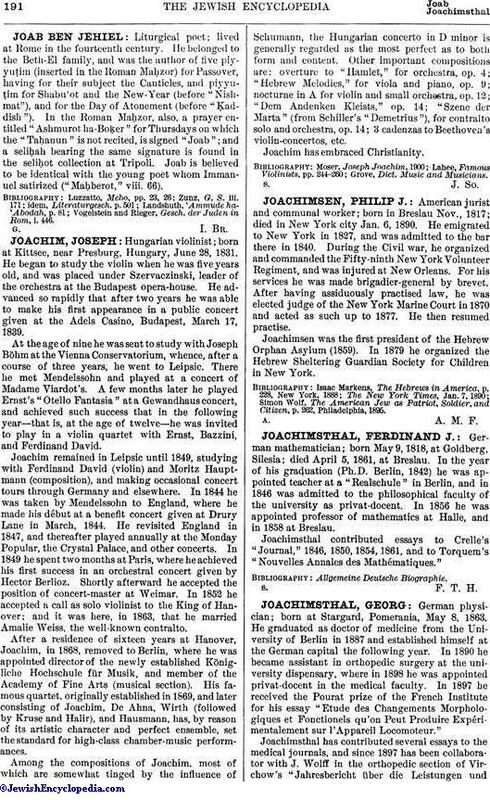 In 1856 he was appointed professor of mathematics at Halle, and in 1858 at Breslau. Joachimsthal contributed essays to Crelle's "Journal," 1846, 1850, 1854, 1861, and to Torquem's "Nouvelles Annales des Mathématiques."